This article is part of the World Economic Forum on Latin America 2017 and it was first published in the World Economic Forum Blog, on March 27, 2017. In the latter part of the 20th century, trade integration helped drive economic growth in advanced and developing countries, lifting millions out of poverty. Since the early 2000s, however, a slowdown in the pace of trade reform, a post-crisis uptick in protectionism, and risk of further reversals are taking a toll on trade, productivity and income growth. In this context, regional integration is increasingly seen as a powerful driver of growth and new opportunities. The long-term trend towards regional integration is clear: in the last two decades there has been steady progress towards more integrated regional economies in almost every part of the world. In East Asia, efforts are underway to conclude negotiations on the 16-country Regional Comprehensive Economic Partnership, which would cover several major economies and improve trade in goods and services, investment, economic and technical cooperation, intellectual property, competition and dispute settlement among other issues. In Africa, countries are working to reduce trade costs and bring much needed infrastructure investments, while addressing the challenges the extreme poor face in benefiting from trade. Latin America is no different. The emergence of the Pacific Alliance, an ambitious and forward-looking integration scheme between Colombia, Chile, Mexico and Peru, has revived a push for regional integration aimed at liberalizing the movement of goods, services, people and capital among participating countries. It is also a good platform to further strengthen trade relations with Asia-Pacific countries. Recent interest by Argentina in the Pacific Alliance, changing economic dynamics in the Southern Cone and a fresh interest in closer ties between Mexico, Brazil and Argentina, will surely bring a renewed momentum for integration in the region. Why is regional integration attracting so much interest from policy-makers in different regions of the world? It has been commonly argued that regional integration can only play a limited role in most regions, including Latin America and the Caribbean, because of the similarity of endowments between its countries. While this is often true, this traditional view fails to recognize that deeper regional cooperation can take advantage of proximity and complementarity in production of goods and services. It is a fact of life that economic activity is geographically clustered, be it because trade costs are lower or because determinants of economic performance, like endowments and institutions, are similar among neighbouring countries. Policy-makers internationally recognize regional integration as being vital to economic growth and trade, and therefore to the creation of more and better jobs. In addition, in the 21st century, the main motivation for regional integration is to explore the potential for two interrelated channels of trade: the emergence of regional production networks (or regional value chains) and the development of cross-border trade in services. 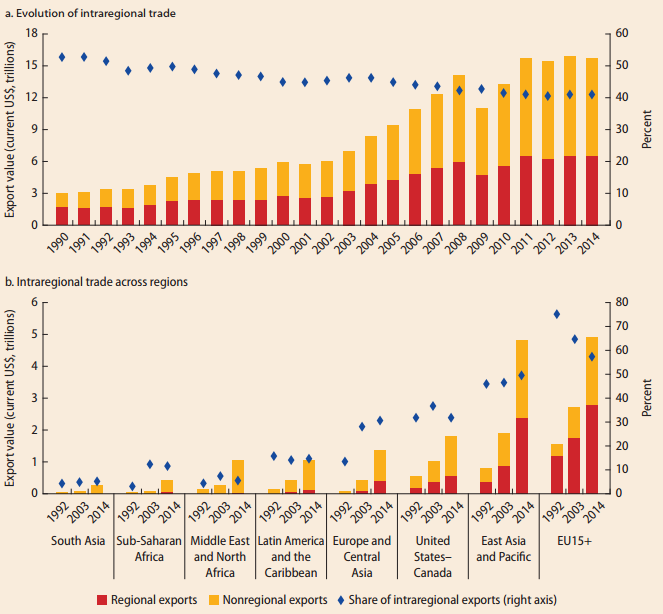 Trade in services is often neglected in the analysis of trade complementarity but is gaining more importance, as it continues to grow steadily, contributing to boosting economic growth. In 2014, trade in services accounted for 13.2% of the world’s GDP. A study just released by the World Bank’s Latin America chief economist identifies important advantages of regional integration for Latin America’s economies: it clearly identifies the efficiency gains associated with deeper integration between the southern and northern parts of the region. According to the study, the average efficiency gains that countries like Argentina and Mexico could obtain from regional partners outside their sub-region are comparable to those that could be attained by trading with countries elsewhere in the world. Latin American integration is still weighed down by relatively high trade costs, mostly associated with geography, but exacerbated by the poor quality of the region’s hard and soft infrastructure. While addressing hard infrastructure represents an ambitious agenda due to the size of investments needed, more attention could be given to the soft components related to improving trade facilitation and border management. For instance, the implementation of the Trade Facilitation Agreement represents an opportunity for countries to strengthen inter-agency coordination at the border and enhance public/private sector dialogue on trade facilitation. These are measures that can lead to the reduction of trade costs. Non-tariff measures refer to all measures other than tariffs that impact the free flow of goods and services across borders, and include technical measures related to product standards and quality specifications, such as sanitary and phytosanitary standards and technical barriers to trade. They also include measures such as import licensing, price-control measures, subsidies, and rules of origin. Initiatives to minimize the trade distortions associated with these measures – many of them with perfectly legitimate objectives – can have a large impact on Latin America’s competitiveness. Opening up to trade is a key mechanism for attracting foreign direct investment and increasing competition in services sectors. It is necessary, however, to ensure that more open trade is coordinated with regulatory reform so that appropriate regulations are in place that address relevant market failures and encourage the competitive provision of services. Addressing these core challenges with comprehensive strategies that include inputs not just from governments, but also from the private sector, will help secure a more promising future for trade integration in Latin America. Desaceleración de las exportaciones: ¿Cómo influyen los riesgos externos? As Western economies look inward, what’s the future for Latin American trade?